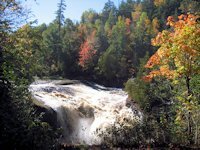 Some of the UP's most impressive waterfalls are located within 50 miles of Wisconsin in the western end of the Upper Peninsula. Coming from Wisconsin, heading on Highway 2 east out of Ashland, Wisconsin towards the Michigan Upper Peninsula, the road eventually leaves the lakeshore. You can rejoin the lake by taking Wisconsin Hwy 122 north near the berg of Saxon. That road morphes into Michigan 505 when you cross the state line - which is the Montreal River. 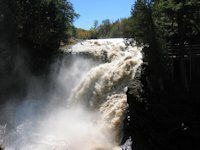 (There are two impressive waterfalls, Saxon and Superior Falls, on the Montreal River - see pictures on the Wisconsin Waterfall Directory page). Continue on 505 climbing the bluffs past the Little Girls Point campground and you'll soon arrive in Ironwood, Michigan. Then rejoin Highway 2 and head east towards Bessemer. Look for the sign for the Black River Scenic Byway on the outskirts of Bessemer. Great hiking, waterfalls, and scenery are waiting! After visiting Black River Harbor you can return to Highway 2 and continue east towards Wakefield, Michigan. About a mile north of town on Michigan 28 you encounter the road to Presque Isle Scenic Recreation Area - more impressive waterfalls, hiking, camping, and scenery. The Black River begins about 30 miles south of here in Wisconsin, heads north into Michigan while dropping over a 1000 feet in such a short distance! 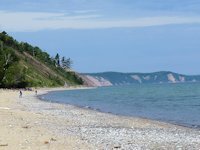 The last few hundred feet of this drop are part of this national parkway that includes hiking trails to several falls plus a nice camp ground and picnic area near the harbor. 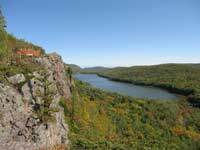 The North Country Hiking Trail bisects the parkway as well. Geology buffs will enjoy this hiking this area, identifying the traces of volcanic upheaval from eons ago. After this hike, I think I now know can recognize greenstone and conglomerate rock!! One of the undiscovered jewels along the UPs Lake Superior shoreline. Nice campground, terrific waterfalls, good hiking trails, spacious picnic area. Located at the extreme western end of Michigan's Porcupine Mountain State Park, the Presque Isle river runs parallel to and about 15 miles east of the Black River. Take Highway 28 north out of Wakefield for about a mile or two until you intersect with County Road 519. Presque Isle harbor is about 14 miles. 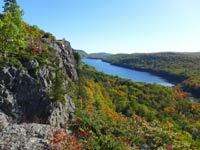 As with the Black River area, there are miles of great hiking trails and scenery. The campground and picnic area is more rustic than what we found at the Black River campground. In 2002 they were having trouble with a contaminated water supply and at that time lacked the funds to install the necessary filtration systems. So plan to bring in your own fresh water supply. Unfortunately water levels were down quite a bit so the falls were a shrunken version of their greatness! But still neat. But on a subsequent trip we did find higher water levels. The presque isle river cascades are just upstream from the suspension bridge. There are sturdy boardwalks and stairs along the river bank . . . as well as some viewing areas that are handicapped accessable. See More Presque Isle WaterFall Pictures (spring time high water levels). The "Porkies" have some great hiking trails and scenic areas . 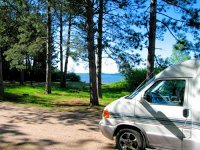 . . plus camping, waterfalls, rivers, and Lake Superior beaches. You could easily spend a week there exploring what it has to offer and still leave lots for future visits. 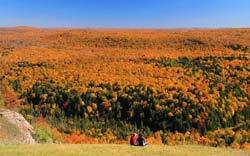 Fall Color & Hiking in the Porcupine Mountains. Tahquamenon is a large (40,000 acres, 13 miles long) state park with two widely separated camping areas. The highlight of the park is the Upper Falls, almost a 50 foot drop and stretching across 200 feet. At times as much as 50,000 gallons of water per second cascade down. 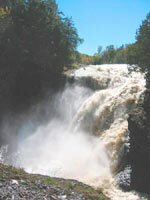 See waterfall pictures and more information on Tahquamenon Falls State Park.